Simply put, without the massive amount of money being spent from the Recovery Act, bundlers-turned-government-cronies would have been unable to funnel billions of dollars to friends and colleagues. Multiple independent investigations into the Obama Energy Department’s failed loan program reveal a pattern of corruption involving 2008 campaign bundlers, stimulus funds and sweetheart loan deals. The reports confirm the suspicion that Solyndra’s $535 million boondoggle was only the tip of the iceberg. In an extensive report last summer, iWatch News – the investigative reporting unit of The Center for Public Integrity – analyzed campaign contributions attributed to Barack Obama’s biggest fundraisers and found a close correlation between the amount of money raised and reward received. 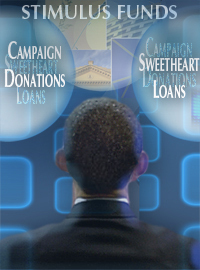 Of the fundraisers considered “bundlers” – people who help campaigns skirt the $2,500 individual donation limit in federal elections by pooling money – 184 of 556, or nearly one-third, of them or their spouses joined the Obama administration in some capacity. Half of Obama’s ambassador corps raised $500,000 or more. Social perks for bundlers translated into more than 3,000 meetings or visits at the White House. Appointing fundraisers to political positions isn’t new. What makes Obama’s bundlers unique is the hand many of them played in channeling federal tax dollars to their personal investments. So far, the most famous example of an Obama campaign donor cashing-in on green energy money is Solyndra investor George Kaiser. Kaiser, a billionaire, raised at least $50,000 for Obama’s 2008 campaign. In March 2009, Kaiser’s investments in Solyndra paid off handsomely when the Department of Energy extended the company a $535 million loan to build a new facility in Fremont, CA. Three years later, Solyndra is bankrupt, but Kaiser is sitting pretty. In subsequent negotiations, the Energy Department agreed to let private investors like Kaiser jump ahead of taxpayers in the creditor line if Solyndra went belly-up. With the company insolvent, a creditor’s ability to recoup his losses depends on how many others must be compensated before him. In an interview discussing his book Throw Them All Out, author Peter Schweizer explains that of the $20 billion in green technology loans handed out by the Energy Department, $16 billion can be traced to Obama-related companies. By this Schweizer means companies invested in or directed by Obama campaign bundlers or people who served on his 2008 campaign finance committee. Four of those took high-ranking jobs at the Energy Department. Combined total raised: $1.6 million. Of the 27 green tech companies invested in by Al Gore and his business partner –and Obama bundler – John Doerr, 16 received Energy Department loans. As Schweizer notes, the Gore-Doerr 59 percent success rate was well above the 10 percent approval rate among all applicants to the loan program. More Solyndras are on the way. Last week, thermal solar company BrightSource canceled its Initial Public Offering due to lack of interest from the market, but only after it received $1.6 billion in Energy Department loans. In Obamaland, taxpayer money chasing bad investments has only one explanation. Defenders of the Obama administration’s largesse with other people’s money note that the Energy Department’s green technology loan program began in the latter half of George W. Bush’s administration, so why haven’t we seen reports of corruption and abuse from that era? When the American Recovery and Reinvestment Act of 2009 and its $787 billion were passed, it was with the intent to kick-start a nationwide economic rebound with massive government spending. Anybody who claimed the ability to create jobs was considered for funding, but stimulus dollars were directed to supporters of liberal causes. Public employee unions took the lion’s share of money spent on “infrastructure” projects like road paving and teacher salaries, while politically connected companies cashed in on subsidies and loans to create the still unrealized dream of green jobs. When he entered office in 2009, President Obama promised Americans “the most transparent administration in history.” Who knew it would be so costly?